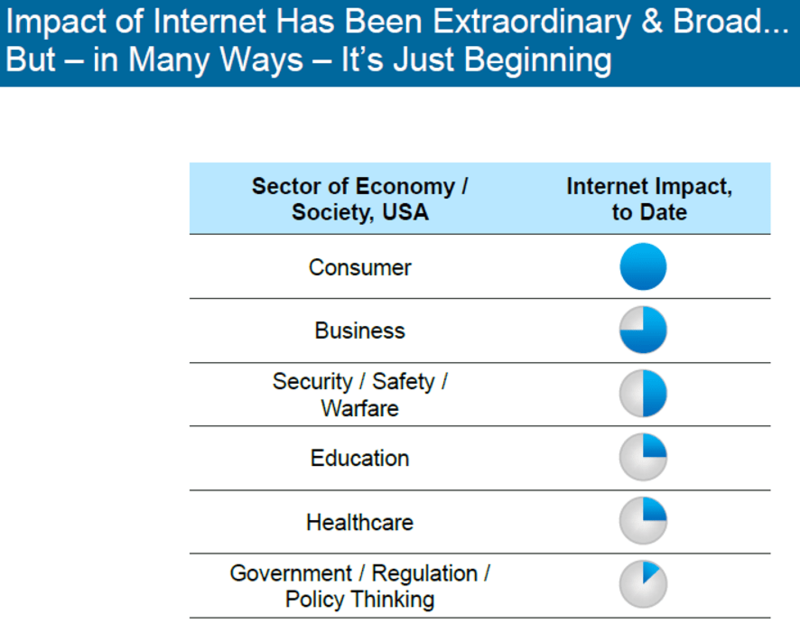 Mary Meeker of Kleiner Perkins Caufield & Byers has published this year’s Future of the Internet analysis. Globally 73% of us have a mobile phone. She presents an interesting slide on how content is discovered in an internet world where content is now shared in platform engines (Twitter, YouTube, Instagram, etc.) rather than just Search Engines. As we all know, the Internet has had the greatest impact on our consumer lives. Businesses and other industries are slowly catching up which highlights we are still trying to understand how to leverage digital technologies to their fullest potential for business and government sectors. The presentation hypothesizes that computing is being re-imagined by changing business processes one segment at a time. What this means is summarized by Aaron Levie (@levie) “the opportunity for software is to transform the work itself”. Ironically she points out that “enterprise” entrepreneurs are now targeting well established business technology paradigms such as: email, point of sale systems, information overload. All of the solutions highlighted in the slide deck are taking advantage of what Gartner calls the Nexus of Forces: mobile, social, big data and cloud. To many technology experts, this is the future of computing as it helps entrepreneurs with lowering the costs of entry to make these grand business transformation possible. They all are optimized for the mobile experience (or the smaller screen). The presentation has a major focus on consumer applications but this is the point – the lines between consumer applications and enterprise applications has blurred. Users are creating and curating content creation in new ways and this content is largely created on mobile devices. A major section of this analysis looks at the effects that millennials are having on the work force in the USA. Have our business systems and technologies kept pace? No. As a Canadian is a disappointing to see no Canadian firms in the top 20 global internet market leading companies (slide 173). But is also not that surprising based on how the entrepreneurial market works in Canada and how Canadian firms invest in technology innovations. As the presentation highlights, digital disruption is everywhere around us and opportunities abound. The future of business will be completely re-imagined in terms of how services are provide, how goods are bought and sold and ultimate how business interact with each other and consumers. We are in exciting times and our book will explore what all this means and how to capitalize on these immense opportunities.